Unique squeegee with multiple wet apply use - Chrome, Paint Protection Films, Automotive, Marine, Residential, Commercial Window Tinting, Paint/Color-change wraps. Absorbs and holds 1.25ml of water per inch. Contains no metal and is rust free. Size 4" x 2 7/8"
Did you know that you can wash Geek Wraps Squeegees? 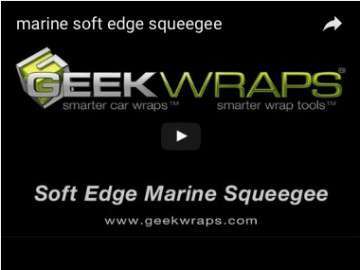 An added benefit to Geek Wraps squeegees is that the smooth edge is "sewn" on instead of glued. This allows them to be washed and re-used more often for a longer useful life than other squeegees.